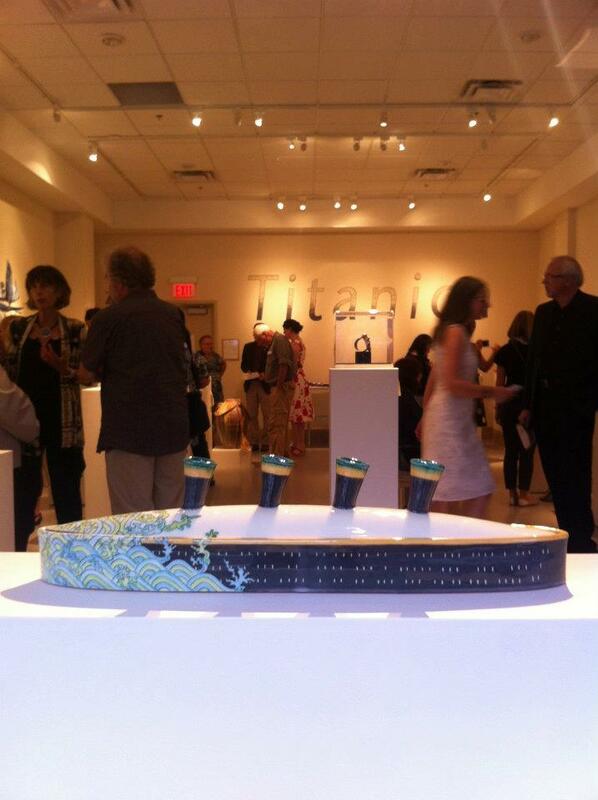 The Nova Scotia Designer Crafts Council member exhibition for 2012 was Titanica. Members were asked to create new works of fine craft with the word titanic in mind. They could use any definition they would like, some focused on the ship Titanic, others the Titans, Titanium or in my case titanic as in large. Unfortunately the majority of the submissions were Titanic ship related, so my entry didn’t really mesh with the rest of the chosen items, so I was out of luck for this year. That being said, I was pleased that the call for entries forced me to try a new technique, and work in a scale which I was not accustomed to. 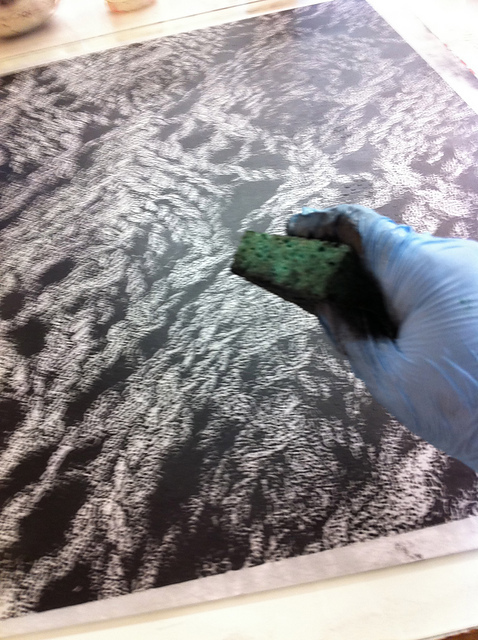 Paper lithography is a method that uses a Xerox print which you coat with gum arabic. You then wipe off the excess and ink the image, wipe again, and print from the “plate” onto paper using a printing press. It allows you to create large images. I enjoyed the process, but as I’ve mentioned in my other project posts, I am all about the texture, and this process still doesn’t meet that need. 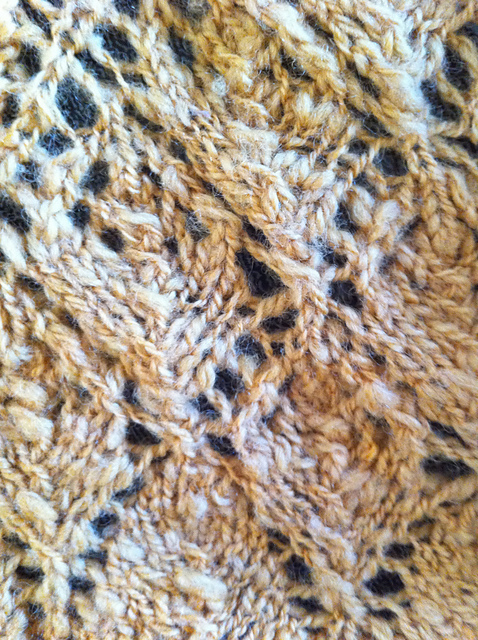 The image I started with was one I took of the shawl that my friend Jali gave to me for my birthday several years ago. She had spun the yarn, dyed it with onion skins and knit the shawl using a pattern which I should know, but can’t seem to remember at the moment. 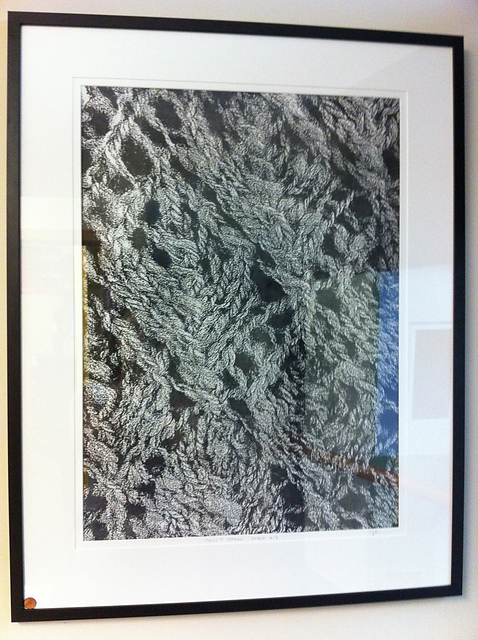 I took the digital image of the shawl, manipulated it in Photoshop and had it photocopied large scale to use as my printing plate, which then went through the process described above. It is big, and I love it, it is a special reminder of a woman who was kind, talented and so in tune with the world around her.